What is MOS? No, it’s not that green stuff that may grow in your garden. 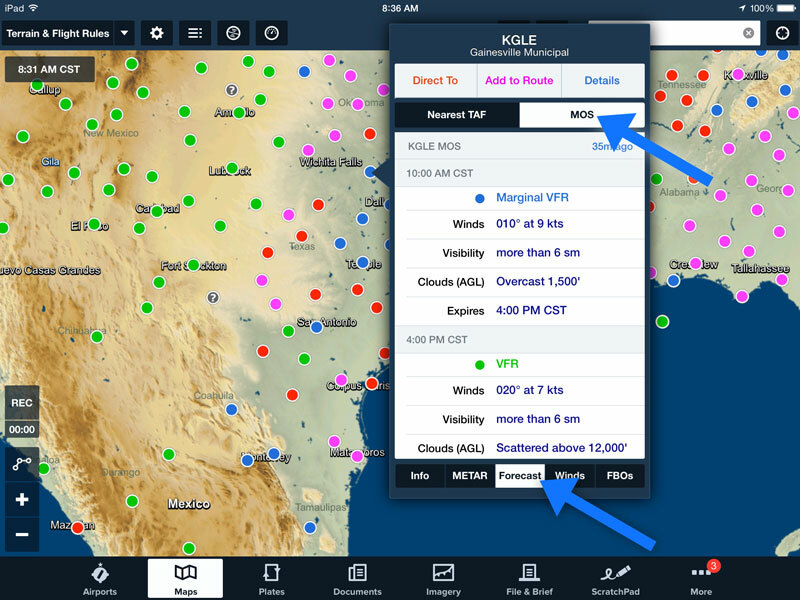 But you will find MOS in the latest release of ForeFlight Mobile. MOS stands for Model Output Statistics. As the name suggests, MOS is derived from the output of weather prediction models developed and run by research meteorologists at NOAA. The use of MOS has actually been around for decades, but has only recently been introduced for aviation use. Weather prediction models provide forecasters with long and short term guidance in the form of various meteorologically significant variables like pressure, humidity, temperature, and wind. Meteorologists compile this information and other derived data and display it on standard charts and diagrams to make a forecast. These models are certainly useful, however they do not automatically produce a point forecast for a specific town or airport as pilots would expect to see for preflight planning. Enter MOS! The job of MOS is to take the “raw” model forecast and attempt to improve upon it using a statistical method to produce an objective and more useful site-specific forecast that also attempts to quantify uncertainty. To make the original model forecast better, MOS takes into account an historical record of observations at forecast points (such as airports), removes any known systematic model biases, and quantifies any uncertainty (like precipitation or thunderstorm chances) into probabilistic forecasts. MOS transforms the model data into weather elements that the model does not directly forecast. This includes sensible weather elements basic to aviation such as sky cover, ceiling height, visibility, wind speed and direction, the probability of precipitation, and the precipitation type. MOS is such a great tool that it’s used by local NWS forecasters all over the US to create more accurate local forecasts for specific towns or cities. These forecasters also rely on MOS as one form of guidance to construct and amend a TAF. While TAFs provide the official forecast for 666 airports throughout the US and its territories, MOS provides weather guidance for over 2100 airports including some military air bases. MOS is especially accurate in the first 6 hours and, since it is location specific, will usually provide you with more detailed guidance than using the area forecast (FA) alone. One thing to note, however, is that MOS should never be used for legal requirements such as determining an alternate on an IFR flight plan (more on that below). Another distinct benefit to pilots is that MOS is updated hourly. You’ll get a refreshed forecast at an airport that will tend to track better with the actual weather than with the area forecast. Moreover, MOS is highly tailored for each airport. So if the airport is in a valley or near an ocean or next to a river, MOS is aware of the nearby terrain features and local effects of the weather for that airport. MOS is a great tool for better understanding the local weather picture during your flight planning, but there are some important limitations you should be aware of when it comes to MOS producing a TAF-like forecast. MOS cannot forecast multiple cloud layers as you see in a TAF. Except for when the forecast is shown as clear, a single fixed cloud layer is the best MOS can do. It cannot directly forecast showers in the vicinity (VCSH) or fog in the vicinity (VCFG), nor can it forecast precipitation intensity. Additionally, MOS cannot forecast non-convective LLWS and no significant weather (NSW), both of which can appear in a TAF. MOS is also unable to predict a variable wind and can’t tell the difference between rain and drizzle or mixed precipitation including freezing rain and ice pellets. Currently, MOS only provides domestic forecasts -so you won’t see MOS forecasts for airports outside of the US. The find the MOS forecast in the app, simply select an airport or weather station from the Maps view. In the pop-over window, tap the Forecast tab at the bottom. Then press the MOS button to reveal this new forecast product. You can also view the MOS forecast in the Airports view by tapping on the Weather tab. 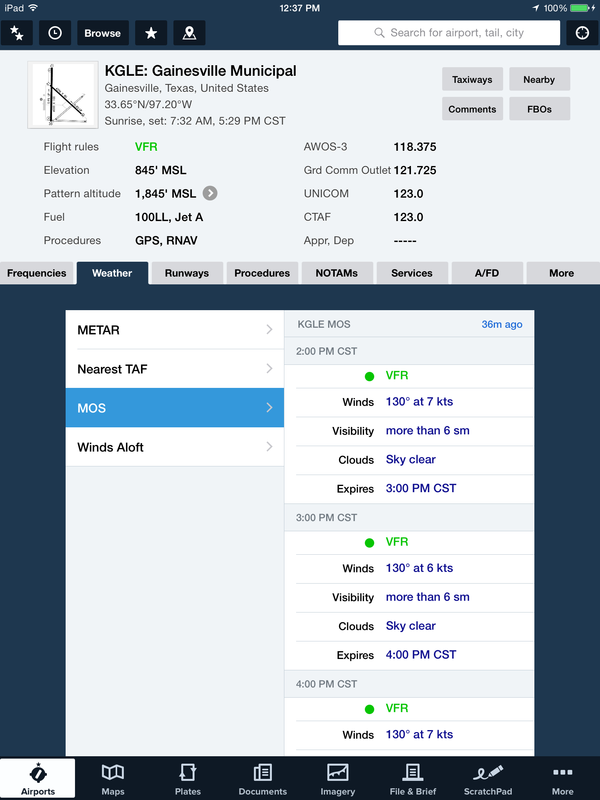 This entry was posted in Weather and tagged aviation, ForeFlight Mobile, iPad, Weather by Scott Dennstaedt. Bookmark the permalink.